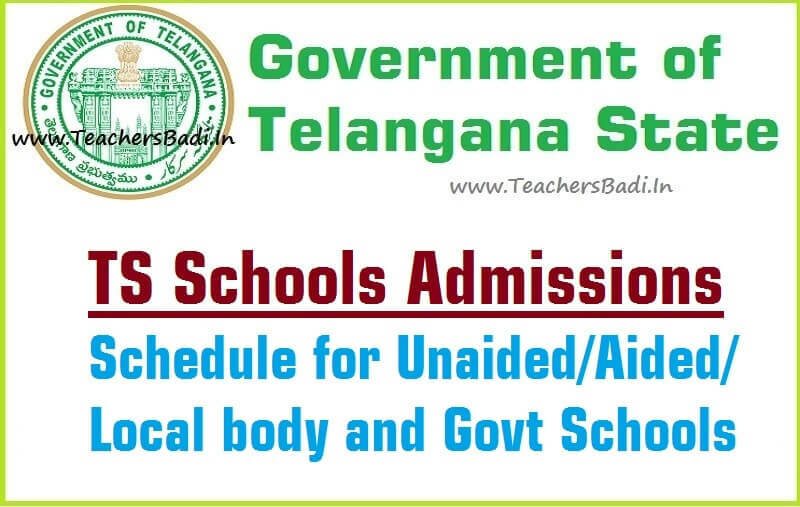 Common Admission Schedule has been announced for TS Schools by the DSE Telangana, New Academic Start from March 21, 1st Class classes start from March 27, DSE Telangana has instructed to all HMs that, Admissions should be done as per the Schedule. DSE Telangana, Rc.No. 846/PS.1-2/2015 Di. 14-03-2017 Subject: School Education - Admission Schedule issued for the managements of Unaided / Aided / Local body and Government Schools in the State. Reg. 1. G.O. Ms. No. 01 Edn dt.01-01-1994. 4. S.E Pr. Rc. No. 846/PS.1-1/2015-2 Dt. 19-11-2015. 5. S.E memo. No. 846/PS.1-1/2015-2 Dt. 18-04-2016. 1) Three months from the date of closure of the normal period of admission. (2) Where a child is admitted after the extended period, shall be eligible to complete studies by special training. Sub: School Education – Admission schedule and other related programmes issued for the managements of Government, Local body, Government Aided schools in the district - Instructions Issued – Reg. Ref:- 1. Proceedings of the Commissioner and Director of Schools Education, TS, Hyderabad Rc.No.846/PS.1-2/2015, Dt: 14.03.2017. While Proceedings of the Commissioner and Director of School Education, TS, Hyderabad Vide Rc.No.846/PS.1-2/2015, Dt: 14.03.2017, all the Mandal Educational Officers, in the District are requested to communicate a copy of the admission schedule to all the Headmasters of Government, Local body, and Government Aided schools for the academic year 2017-18 and request the headmasters to adhere the instructions issued by the Commissioner and Director of School Education, TS, Hyderabad vide ref 1st & 2nd cited and follow the instructions, submit the compliance report to this office. Therefore, all the District Educational Officers / Regional Joint Directors of School Education in the State are requested to instruct all the managements to adhere to the above Admission Schedule scrupulously, and instruct all the Dy.E.O.s and MEO under their control shall take necessary action. In respect of Government, Local Body and Aided Schools, Children should be admitted in the School as and when a Parent approaches or a child reports to School, on the same day. Wide publicity shall be given to the admission schedule indicated above. The above instructions shall be followed scrupulously.